The Monk Fruit is a small calorie-neutral fruit grown in Asia and has recently gained favor as one of the best sugar substitutes available. Also known as Luo Han Guo, monk fruit contains powerful antioxidant compounds named mogrosides which have been shown in research to offer several health benefits. The monk fruit extract can be used to sweeten foods while having a near-zero impact on overall blood glucose levels. For this reason, monk fruit sweetener has become very popular in recent years. Monk fruit, also called Siraitia grosvenorii or Momordica grosvenorii, is a vine-growing perennial fruit native to Asia. This fruit gets its common name from having been grown by Chinese Monks sometime beginning in the 13th century. 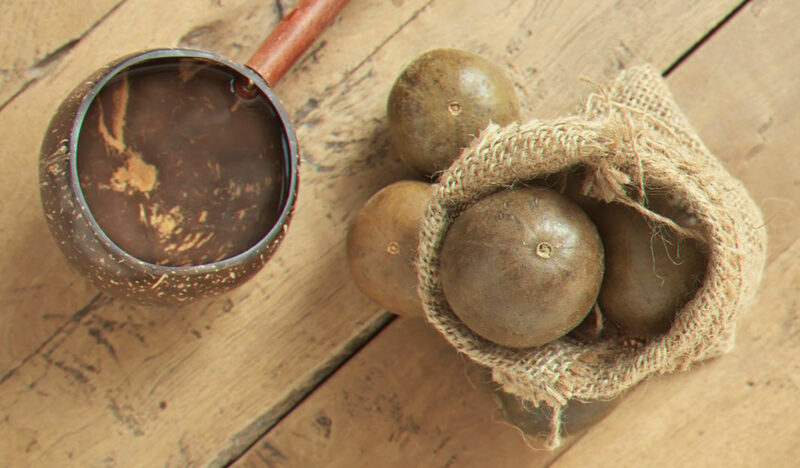 Traditionally, the monk fruit has been used as a means to naturally treat such health issues as heat-exhaustion, fever, and many inflammation-related conditions. The first study of the Monk Fruits ability to be used as a sugar substitute began in the 1970’s, and now the patent for the commercial processing as a natural sweetener is held by Procter and Gamble. The Monk Fruit contains a group of compounds named mogrosides, which are part of a class of compounds named triterpene glycosides. Mogrosides make up roughly 1% of the monk fruits overall composition and are typically extracted through a solvent-based process. This process yields an 80% mogroside powder and makes use of the remaining components for products such as monk fruit juice. The mogrosides are broken into several different classifications, each containing unique compounds. These are typically labeled as Mongroside-I, Mongroside II, Mongroside, III, Mongroside, IV, and Mongroside V. These compounds are up to 400 times as sweet as sugar, and revered for their ability to offer low-glucose-impacting alternatives to sugar. The Monk Fruit offers a notable health benefit in providing a sugar substitute that has a low impact on blood glucose levels. This alone can provide much-needed assistance for those suffering from obesity, prediabetes, and diabetes. In addition to the more obvious benefits of helping cut back on sugar intake, the monk fruit has several other health benefits as well. These benefits are still being understood by science, though initial studies paint a promising picture of monk fruit being used as a therapeutic agent eventually. For now, it seems most appropriate to consider monk fruit as a useful aid in maintaining a healthy and balanced diet. Below, you’ll find a brief overview of the health benefits of monk fruit. In one study, researchers found that two forms of the mongroside compounds found in natural monk fruit extract were able to function as powerful natural antioxidants. This study found that a specific compound found in mongrosides—named cucurbitane triterpenoid aglycon—had a particular ability to reduce DNA damage associated with oxidation processes (R). In another study conducted on mice, researchers found that monk fruit extract was able to significantly antioxidation in the pancreas. While still uncertain on its exact method of action, researchers suggest that mongrosides are metabolized somewhere along the epithelial lining of the GI tract, transforming into the Mogrol form capable of entering cells (R). While the particulars of this aren’t well-documented, the general takeaway is that eating monk-fruit sweetener would likely be able to provide these types of antioxidative benefit. Monk fruit has the inherent benefit of motivating one to use less overall sugar, which has been linked to nearly all major diseases—including cancer (R). Beyond this indirect evidence, there has been quite a bit of research conducted on the monk fruits’ ability to offer anticancer action. One study found that the mongroside V compound found in monk fruit was able to significantly lower tumor activity in mice. This study measured the specific activity of Epstein Barr Early Antigen (EBV-EA) activity, known to be correlated with cancer. Mice given the monk fruit treatment were seen to have nearly 20% less EBV-EA activity (R). Another study investigated the ability of a compound named Cucurbitacin E, which is found in the monk fruit. This compound is produced by certain plants as a natural defense mechanism against herbivores. Researchers found that the Cucurbitacin compound was able to reduce tumor activity in vitro, suggesting it may be a viable cancer treatment for human cancers (R). These are obviously results that need human confirmation but its always promising to find new natural compounds that might help stave off the progression of cancer. As mentioned in the study before regarding the ability of monk fruit to reduce inflammation, the mongroside compounds are able to specifically target pancreatic cells. That same study noted that this type of specific action suggests that monk fruit will allow better insulin secretion in high glucose and high lipid environments (R). Without changing your current sugar and fat intake, monk fruit may be able to help improve insulin production. Other research conducted in animals seems to have pinpointed this specific type of beneficial action to the mongroside compounds found in monk fruit which makes sense when comparing to other related research (R). Tangentially speaking, using any natural sugar substitute will help address diabetes Type II issues as a general means of lowering the glycemic impact of meals. With monk fruits powerful mongroside compounds being as much as 500% sweeter than sugar—it seems that this sugar might become the monk fruit extract substitute! Monk fruit isn’t available as a fresh fruit commodity due to its remarkably short shelf life. If you want to experience this fruit in its naturally fresh form—you’ll have to fly to China. Monk fruit has been accepted by the FDA as being generally recognized as safe (GRAS) and approved as a natural sweetener in foods (R). When shopping for a monk fruit sweetener be sure not to buy one with other added sweeteners such as erythritol, stevia, or even dextrose (sugar) in some cases. There’ll not all bad but none are monk fruit. Monk fruit is a powerful natural sugar substitute that has shown some tremendous health benefits. It’s antioxidative action, anticancer activity, and ability to help not only stimulate insulin production but also substitute for sugar among diabetics make it a powerful natural compound. It isn’t available as a fresh fruit unless in its native China region, but natural monk fruit sweetener products are available online for purchase. Be wary when shopping for these products—many contain blends with other sweeteners such as stevia, erythritol, and inulin. Anything with a ‘proprietary blend’ is likely a lot more filler than it is monk fruit extract. More research is needed to confirm the health benefits of monk fruit, but it’s clear that it can serve as a potent natural sugar substitute. We try to write about topics that will be of interest to all those seeking to learn more about the benefits of living a healthy lifestyle. If you found this article helpful please let us know by using the rating box below.